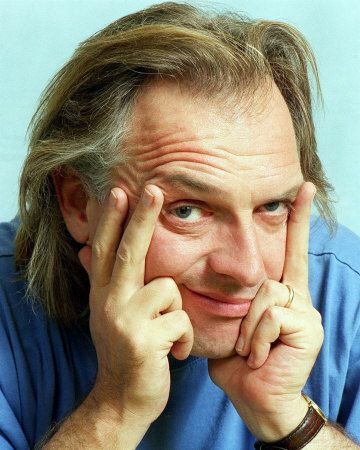 It has been announced that comedian Rik Mayall has died. Already social media has gone into overdrive with tributes from those in the entertainment industry as well as members of the public taking over these channels of communication. There’s no doubt that this is a huge loss, and a tragically young age too, and this will affect an awful lot of people. Famous people do occasionally die young, it’s nothing new, but there’s something about Rik that will touch a nerve more than most. When it’s one your peers or someone you grew up with watching on TV, it really does put your own mortality to the forefront. I was at school when The Young Ones started in the early 80s and the character he portrayed, plus that of Kevin Turvey really summed up the era we were living in. OK, he was older than me but not by much – a relatively paltry 11 years. I got the impression that Lord Flasheart in Blackadder was a role that he took particular pleasure from and in many ways he stole the show despite only a few appearances not unlike the the ‘genial’ Grouty did in Porridge. Rik was loud and brash in pretty much any role he played but that shouldn’t hide the fact that the characters were often poles apart – he was a terrific actor. Take the Tory MP Alan B’stard and compare with Drop Dead Fred or Richard “Richie” Richard from Bottom for example. He could dip into a suave persona but the shouting Rik would never be far away. That may seem pretty 2 dimensional to carry it off in so many different shows and movies really puts his ability into focus. I last saw him perform in Man Down last year with Greg Davies who was not unlike Rik in persona himself. It was certainly an understandable casting decision despite the height differential. Man Down was a rather curious show which I enjoyed but with Rik playing the lead’s father highlighted that he wasn’t the spotty student in the Young Ones anymore. As a swansong this was probably not his finest moment but he was still arguably the best thing in it regardless of the totally outlandish scenes he was asked to play. No matter, it was all part of the man and we will miss him dearly – it’s hard to imagine that we’ll ever see his like again. RIP RIK – we will miss you. After a long time of not posting I thought I’d post a few nuggets of what’s been going on over the last few years. This blog has been a bit of a dumping ground for big ideas which have since evaporated. It’s a bit embarrassing to look back if I’m honest but I guess it gives an idea about me as a person. Since my last update I’ve separated from my wife but I’ve met someone new and life generally is good. Work is going well, money is not as tight as it once was and over the last three months I’ve lost over a stone in weight. For this first post I will focus on this last aspect – the words are taken from a forum post which announced my initial progress. 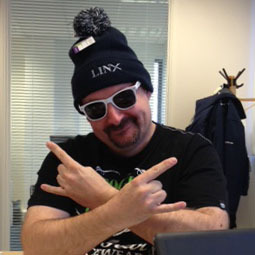 Last Thursday I started a sponsored slim in aid of a care scheme’s social fund for the elderly. This will enable them to go on trips and also have special events arranged at the home itself. 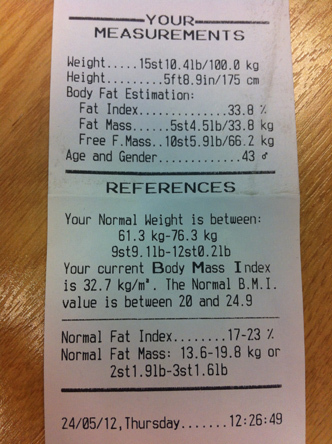 Last night was the first weigh-in since I started and over the last 7 days I’ve lost….11 POUNDS!!! I’ve been asked about how I did it and if I’m honest it was a lot simpler than I thought it would be. It has taken some self control but it hasn’t needed me to run a daily marathon or anything. Foodwise my breakfast is about 60-70g museli with semi-skimmed milk and lunch is a chunky but tasty ham or chicken sandwich with no mayo on wholemeal bread with salad and possibly a nice low fat dressing. I sometimes have a chilli flavour dressing so even if it may seem fairly bland at first sight it has a bit of a kick. Morning and afternoon snacks are either fruit or a couple of spicy crackers (no spread) and I’ve cut back on tea and coffee and skipped the sugar. I have a tiny bit in coffee but I drink tea mostly now. All in all I have half the hot drinks a day I used to and have replaced them with water and the occasional fruit juice. Oh, I’ve probably also been helped by giving up wine and chocolate for Lent though I have had a couple of beers and a vodka and a diet coke. Tend not to drink during the week anyway. For my evening meal it’s again about being sensible in quantities – think about what you want and take 2-3 forkfulls off to lower your intake. Get plenty of veg, use low fat spray when frying anything and make sure that whatever you have it has flavour – bland is just boring. Exercise-wise I’ve been walking more by getting off at earlier bus stops and and taking some long routes to places if I need to go anywhere. Advance planning comes into that so you have make the time to do it – it’s nice to get a bit of fresh air too. I was stunned by the amount I lost but it’s clear to me that you don’t have to go bonkers to make a difference. Keys for me were to drink more water and less caffeine or fizzy drinks, replace snacks with something flavoursome or fruity, cut back on the alcohol a bit and walk a bit more. The final key is to choose a goal and have a reason to keep to it – mine is linked to a good cause and it has an end date so it will keep me focused. To my immense surprise I’m down to 15 stone 10lbs! I found this quite remarkable as I’ve probably done less exercise, relented with a couple of evening snacks and positively gorged at a two day conference in London earlier this week. Lots of Mexican food clearly loaded with fat and big Sunday lunch too. If this week proves anything it’s that if your sensible about snacking on crisps, chocolate and biscuits you can still lose the pounds. 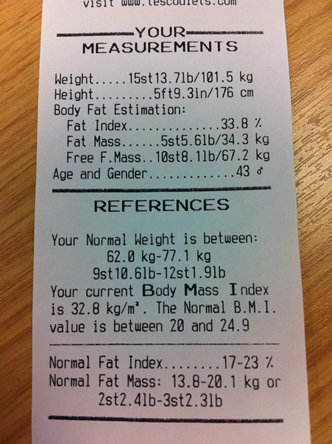 As I keep repeating, long term I need more than that change to get me down to 12 stone or thereabouts. This is where the British 10K comes in because as of today I’ve officially entered and my Just Giving page for Young Epilepsy is live – no turning back now! To help with the training I’ve signed up to a smartphone app called RunKeeper which I tested with a walk around time at lunchtime. Looks pretty useful. I’ve updated the ticker device and here’s the Countdown Clock too. 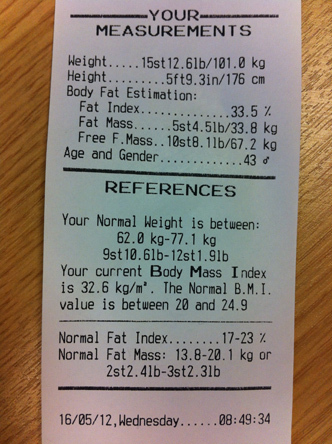 So there you have it – another pound lost! Hurrah! I have to admit I was a bit worried this week because there was a couple of pretty substantial meals in there and then the pizza/chocolate nibbles thing on Monday. It’s a small drop but I’m still 4lb up on my target so it’s going well. Yesterday I all but confirmed that I would take part in the British 10K in London in July. That will kickstart my exercise and will certainly help with the plan over the next 6-7 weeks. So here we are on Monday lunchtime with approximately 43 hours until the next weigh-in. Overall I’m still performing better than before the plan began but I’ve not not done as good as I might’ve done this past week. I really need to get some proper exercise and the threatened announcement that will form part of that is no nearer to happening. I need to pull my finger out. I have so many little jobs that I could cross off my list that I just need to get on and do them. This involves some paperwork from an accident claim from our car crash last year and various other admin tasks not to mention the prep for a meeting tomorrow. It could be embarrassing if I don’t get that done. The reason for the update now is that just delivered to the office are several pizzas along with some rather sumptious snacks including flapjacks and various chocolate coated yummies. Coincidentally I have very little money on me today so the pizza does help save the pounds but I shall have to be far more restrained than normal. Usually when we get these deliveries I have been known to have anything up to eight slices and take the leftovers home afterwards – no such luxuries today with that weigh-in looming. Another two days has passed since the weigh in and nothing particularly remarkable has changed except that I’ve noticed myself wanting to nosh at silly times again. Fortunately I have so far resisted. On Wednesday it was the 14th anniversary of me and my (now) wife getting engaged.We’re not really in a ‘slap up meal’ territory at the moment for financial reasons but we had left it a bit late to organise a babysitter anyway. For that reason we head off to the Paul Pry for lunch. I had a jacket potato with sour cream and salad plus a tasty tomato and basil soup. Very tasty and very reasonably priced. Yesterday was unusual in that I rather ODd on pitta bread. I finished off the last three at work because I’d have had to throw them out otherwise but when I got home pittas were on offer again as a twist on a steak sandwich. I whacked a chunk of the meat in two and stuffed with lettuce and cherry tomatoes. There was also a bit of gammon and a few mushrooms available so I nibbled on those too. I had muesli for breakfast today and another jacket potato which was very nice but I’ve not been very adventurous with the menu this week. I’ve had lots of carbs and not necessarily the right types but as I’ve said, I’m heading in the right direction and have certainly improved. When you’ve been eating the way I have for as long as I have any change is better than no change. On the exercise front I will shortly be making an announcement where I will be forcing this on myself but it will be for a good cause. Over the last couple of days the only ‘additional’ exercise was running half a mile to catch a bus so that I didn’t have to wait another 20 minutes for another. Deck shoes, jeans and a fully laden laptop bag may helped me lose a few ounces but it didn’t do my stress levels any good. For the lack of a 50p piece I didn’t have my 444 day / 4 stone 4lb Challenge weigh in yesterday lunchtime but I’ve had one this morning. They do say that if you’re going to weigh yourself you should do it at the same time of day and I shall try to keep to that. As it happens, first thing Wednesday is probably a more practical day for me so we’ll stick with that for the time being. That’s far better than I expected but I have made some pretty significant changes to the way I eat and purely by cutting back and being sensible over 5lb has gone. I shan’t be resting on my laurels (whatever that means) but it does at least mean that I’m off to a solid start and have something to build on. Ah, that’s put me in a good mood for the day. It also means I can update my little ticker device and while I’m at it here’s the Countdown Clock too. First of all I’m not promising daily updates for all 444 days but let’s see how things go. I won’t go into the finer details of what I ate and my exercise this time because it was not dissimilar to yesterday so today I will be focusing on sleep and making sure I get enough of it. Bad sleep patterns and lack of sleep generally has been my nemesis over recent years. I will explain more in other updates but the root cause is essentially me wanting to spend some time by myself before going to bed. As someone who always used to do things like holidays alone, the crowded nature of family life vastly reduces (if that’s not an oxymoron I don’t know what is) the amount of ‘me’ time I have. This is why I like travelling by bus because it gives me up to an hour a day (30 minutes each way) where I can read, listen to music or podcasts, think about stuff, plan, prepare or just chill. For many people that would be enough but I would like that opportunity at home too. It is my castle after all. As a rule I rarely get to choose what’s on TV but that’s not something I’m bitter about, it’s a choice I make to keep the family happy. My wife Jo likes to have some time to herself too and she knows that if I fall asleep before she does she will need the earplugs because apparently I snore. I can’t believe that actually but I’m not going to argue. It’s nearly two years since I last posted and yet this blog still receives a lot of coverage mostly based on my Tony Robbins music blog and Unleash the Power Within review. This past week I’ve been contacted a couple of times asking me to resurrect it and if I’m honest, there’s no real reason why I can’t. This site was always intended to be a place for me to mind dump a lot of thoughts but over time CN has ended up not knowing what it was supposed to be at all. Is it supposed to be informative, fun, nonsense, educational or….what..? The problem was that the longer I left it the less reason there was to keep it going. Not God, necessarily, just ask another person for it. Yes, I know it’s not metaphysical or anything, but it works. That’s it, that’s all you need to know. Well, there is one other thing, sometimes, if you ask the wrong person, you will get a no. In that case, keep asking until you get what you want. I could do with some more money this weekend as it’s our 11th wedding anniversary and I want to take my wife out for a meal. As it stands it will be little more than a burger as we’re not getting paid until next week…Tuesday, Thursday AND Friday! We need a timeshift calendar as an anniversary gift. And I thought heck, let’s try it! I’m asking for…$100 to take my wife out for an anniversary meal. For this I am willing to offer my time as graphic designer, copywriter and marketer. Take a look at my blog bio – is there anything there that you feel you could tap into that would make life a little easier for you? Do you need a logo creating or a leaflet designed? What about some advertising or brochure copy? Maybe you need advice on social networking or someone to review your website who will see it with fresh eyes? If you have such a task in mind please use my Contact Me page on my blog to get in touch – I’ll be happy to help in any way I can. I may have ended up breaking the forum rules here but if I don’t ask I don’t get. Maybe the powers that be will look at it as some kind of LoA experiment! Robert Green’s mistake for England against USA continues a long run of World Cup villains for the national side. In every tournament since 1966 there has been someone who has has seemingly conspired to derail England’s chances in the game’s greatest contest. To be clear not every culprit listed below applied the mortal blow but each in their own way has contributed to make life for the rest of England team extremely difficult whether in qualifying or in the final tournament itself. Well, Robert Green made a terrible mistake to gift the USA a 1-1 draw in Rustenberg last night it’s true but I’m not too disheartened. It wasn’t a brilliant performance by any stretches of the imagination but I do believe they will get better. USA was probably the toughest group match and they did create a few chances so there is cause for optimism. It’s always better to improve from the start than have a fantastic group stage and then fade away in the later stages as they did in ’82 in Spain. England won their three group matches but then drew 0-0 twice to go out in the second round. In Euro2008 Holland beat World Champions Italy 3-0 in their first match, France 4-1 in their second and Romania 2-0 in the third but lost 3-1 to Russia in the quarter-finals. Probably the best team of the tournament didn’t even make the semis that year. I’ve been watching England in major championships for 30 years and they hardly ever start well. In fact 3-1 v France in 1982, 2-0 v Tunisia in 1998 and 1-0 v Paraguay in 2006 are our only victories in 12 opening matches. 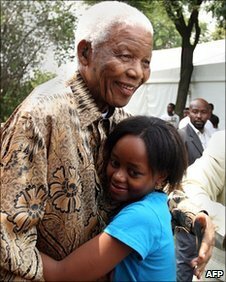 Nelson Mandela‘s great-granddaughter Zenani (13) died last night in a car crash when the car taking her home from a Soweto concert on the eve of the World Cup overturned. The car’s driver has been arrested for drink-driving. South African tenor Siphiwo Ntshebe (35) died on 26 May after suffering from acute bacterial meningitis. He had been selected to sing ‘Hope’, the official anthem of the World Cup, at the opening ceremony. On one of the World Cup discussion forums someone commented on the poor quality pictures at the Mexico World Cup in 1986. I have to admit they weren’t great but I wouldn’t have had them any other way. Penalty-takers will no longer be allowed to halt at the end of their run-ups to try to fool the goalkeeper. The International Football Association Board has decided it is “unsporting behaviour” and made it a yellow card offence in time for the World Cup. Personally I think that a player can take a penalty any way he jolly well likes as long as it’s a single kick at goal. The feinting and stutter is actually a fairly tricky skill which is why so few do it. It’s an unnatural way of approaching the ball especially in a pressurised situation. Because it is a skill and a single kick, it should be allowed. It’s not the takers fault that the goalkeeper commits himself by diving early. Since the World Cup quarter-final against Cameroon in Italy in 1990 where Gary Lineker netted twice, England have had 25 penalties in active play and of these 18 were scored and 7 were missed. A 72% success rate.